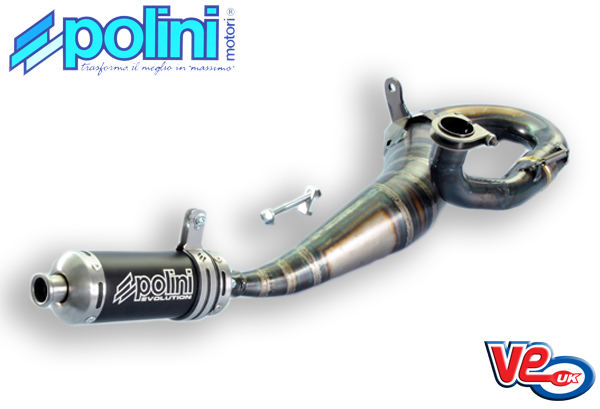 VE (UK), official wholesale importer of Polini performance products, showcase the Evolution exhaust system for the Vespa P125 range of scooters. The Polini Evolution exhaust system has been developed to achieve the maximum performance and power output from the Vespa 125cc engines fitted to the PX models equipped with a Polini cylinder kit. The expansion chamber is completely hand made from 11 cones and has a sporty aggressive look. Finished with an anodised black silencer with a 60mm outside diameter. The silencer has a removable end cap to allow the sound deadening material to be replaced easily for ongoing maintenance. These combined features improve the overall performance of the scooter, both in acceleration and speed. This entry was posted in Vespa parts and tagged evolution, exhaust, polini, px 125. Bookmark this page.